In the present study, we investigated the effect of ripening stage on the physicochemical characteristics, phenolic profile, and antioxidant activity of carob (Ceratonia siliqua L.) pulp. Total soluble solids, maturity index, and sugar content of carob pulp increased at the ripe stage, whereas titratable acidity, protein, total phenolic contents, and antioxidant activity decreased. Analysis of phenolic compounds of three carob varieties (Wild, Sisam, and Fleshy) has been carried out by HPLC-DAD-MS. Gallic acid and its derivatives including monogalloylglucoside, digalloylglucoside, trigalloylglucoside, and tetragalloylglucoside were the main identified phenolic compounds in the studied carob varieties. Gallotannin contents were higher in the extract of green carob pulp than in the ripe one. Carob tree has been grown, since antiquity in most the Mediterranean basin countries, in mild and dry places with poor soils. The world production of carob fruit is estimated to be around 310 000 tons/year. Currently, Algeria, with a production exceeded 3136 tons, is the 6th world producer after Spain, Portugal, Greece, Morocco, and Cyprus (FAO, 2012). Beside its chemical composition characterized by high total solids and sugar content, as well as high level of dietary fiber, minerals, and amino acids, carob has medicinal properties that may reduce the blood glucose and cholesterol (Forestieri et al., 1989). Carob fruit is rich in phenolic compounds which have an antioxidant capacity by acting as an effective defense against reactive oxygen species (Ben Othman et al., 2008). Furthermore, in the previous studies reported in the literature, some individual phenolic compounds (Gallic acid, epigallocatechin-3-gallate, epicatechin-3-gallate, quercetin rhamnoside, myricetin rhamnoside, digalloylglucose, trigalloylglucose, and tetragalloyl-glucose) were identified in carob fruit (Owen et al., 2003; Papagiannopoulos et al., 2004). In the present work, carob fruit was studied as it is both largely grown in Algeria and a good source of antioxidants. The aim of this study was to assess the effect of ripeness on physicochemical characteristics and phenolic profile of three carob varieties (Wild, Sisam, and Fleshy). Three varieties of carob pods were randomly harvested in 2012 from the same region (Bejaia, Algeria), at unripe and ripe stages. The varieties (Wild, Sisam, and Fleshy) were identified following the characteristics described by Tetik et al. (2011). The pods were washed, deseeded, lyophilized (Osterode, Germany), ground (IKA®, Germany) and sieved (500 µm). The powder obtained was used for all analyses. Folin-Ciocalteu reagent was from Sigma (Switzerland); sulfuric acid (97%), sodium carbonate (99.95-100%) and 3,4,5-trihydroxybenzoic acid (96%) were from Sigma-Aldrich (Germany); 2-2′-azino-bis(3-ethylbenzothiazoline-6-sulfonic acid) (ABTS 98%) was from Sigma (Canada); potassium peroxodisulfate was from Biochemika (Switzerland); methanol (99.90%) was from Carlo Erba Reagents (France); acetone (99.90%) was from Prolabo (France); sodium hydroxide (98%) was from Biochem Chemopharma (USA); β-D(+)glucose (97%) was from Sigma (USA); 6-hydroxy-2,5,7,8-tetramethyl-chromane-2-carboxylic acid was from Fluka (Denmark). Total acidity was determined by titration. Brieﬂy, sample was put into a 50 mL beaker and 10 mL of distilled water were added, the solution was homogenized and then centrifuged (Nüve, Turkey). The supernatant was titrated and the volume of sodium hydroxide was converted to percentages of malic acid (AOAC, 1998). Total soluble solids (TSS) were determined by measurement of the refraction index with a refractometer (Navarra, Spain). Total sugars were analyzed by phenol-sulfuric acid method (Dubois et al., 1956). In the test tubes, 500 mg of sample were added to 20 mL of sulfuric acid (0.5 M); the tubes were kept at 100 °C for 3 h. After cooling, each tube was decanted in graduated flask of 500 mL and the volume was adjusted with distilled water at 500 mL, then the solution was filtered. A reaction mixture containing 1 mL of filtrate, 1 mL of phenol (5%), and 5 mL of sulfuric acid was incubated at 100 °C for 5 min. The absorbance was measured at 480 nm. The results were expressed as g of glucose equivalent per 100 g of carob dry weight (g Glu E/100gDW). Eighty milligrams of each carob sample, 2 mL of sulfuric acid, 1 mL of hydrogen peroxide (30%), and 2 g of catalyst were mixed in Kjeldahl tubes. The mixture was heated at 400 °C in Turbosog during 150 min for mineralization. Then, the tubes were cooled and passed in Gerhardt Vasodest 50 system for distillation and titration. Boric acid (3%), distilled water, and sodium hydroxide (32%) were automatically added. Then, the solution was titrated with sulfuric acid. The results were calculated by multiplying the total nitrogen content by 6.25. The mixture of 25 mg of carob pulp powder and 10 mL of 70% acetone was blended under agitation at 50 °C for 90 min. The extract was filtered (0.2 µm, Sartorius) after centrifugation at 1560×g (Biofuge Heraeus, Germany) for 20 min. Total phenolic content was determined according to the method described by Singleton and Rossi (1965). One hundred microliters of sample extract were mixed with 1 ml of Folin-Ciocalteu reagent and 0.8 ml of sodium carbonate solution. Absorbance was measured at 765 nm with a spectrophotometer (Genesys 10UV, USA). The results were expressed as grams Gallic acid equivalents per 100 g of carob dry weight (gGAE/100 GDW). TEAC of the carob extracts was determined according to Re et al. (1999). One hundred microliters of extracts were mixed with 1 ml of ABTS solution. The absorbance was measured at 734 nm. The results were expressed as millimolars of Trolox equivalents per 100 g carob dry weight (mMTE/100 gDW). Identification of phenolics in carob extracts was performed using HPLC-MS system (Thermo Fisher Scientific, San Jose, USA) consisting in a binary solvent delivery pump connected to a photodiode array detector and a LTQ (Linear Trap Quadrupole) mass spectrometer equipped with an atmospheric pressure ionization interface operating in electro spray mode (ESI). The column used was C18 Alltima (150mm × 2.1mm, Alltech). HPLC-DAD-MS system procedure was performed according to Owen et al. (2003). Carob extracts, obtained with 70% acetone, were dried in a rotary evaporator (Heidolph, Germany). The residue was re-dissolved in 10 ml of methanol. The flow rate was set at 200 µL/min and mobile phases consisted of 2% (v/v) acetic acid in water for A and of 2% (v/v) acetic acid in methanol for B. Phenolics were eluted using a first isocratic step at 5% of B during 2 min, then from 5% to 25% of B for 8 min (linear), from 25% to 40% of B for 10 min (linear), from 40% to 50% of B for 10 min (linear) and from 50% to 100% of B for 10 min (linear). Mass analysis was first carried out in ESI negative ion mode (ESI-) and secondly in ESI positive ion mode (ESI+). Mass spectrometric conditions were as follow for ESI- mode: spray voltage was set at 5 kV; source gases were set (arbitrary units/min) for sheath gas, auxiliary gas and sweep gas at 40, 10, and 10, respectively. The capillary temperature was set at 300 °C; capillary voltage at - 48 V; tube lens, split lens and front lens voltages at - 138 V, + 38 V and + 4.25 V, respectively. Full scan MS spectra and additional data dependent MS2 scans for structural investigation were realized on LTQ analyzer. Raw data were analyzed using the XCALIBUR software program (version 2.1). The significant differences between results were calculated by the variance with one factor (ANOVA) and the student test using Statistica®5.5 software. The relationship among all parameters in carob pulp was described as Pearson correlation coefficient (r). 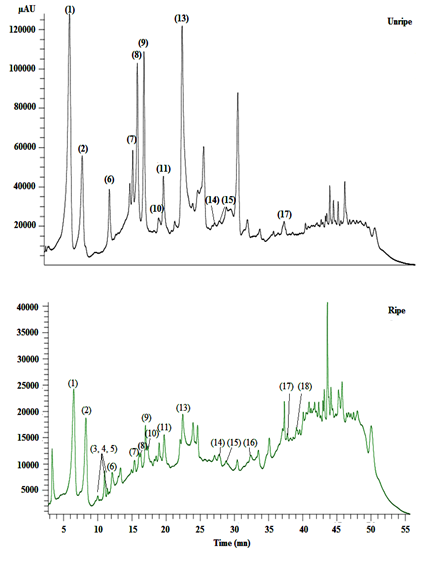 The titratable acidity in Wild, and Sisam varieties at the unripe stage was 2.53%, and 2.68%, respectively (Table 1). Titratable acidity decreased significantly (p<0.05) at the ripe stage. In the other hand, as a fruit ripens, organic acid contents decrease because these compounds were used during respiration or converted into sugars; furthermore, these acids can be metabolized into many constituents such as amino acids (Kader & Barrett, 1996). The highest value of total soluble solids at the unripe stage was found in Sisam variety (9.17%), whereas the lowest one was recorded for Fleshy variety (7.67%) (Table 1). The total soluble solids values increased at the ripe stage by 47.79%, 30.86%, and 52.15% in Wild, Sisam, and Fleshy varieties, respectively. This increase could be attributed to the hydrolysis of starch into simple sugars as carob fruit advancing maturity. The obtained results at the ripe stage were lower than that reported by Turhan et al. (2006). Sugar contents of carob varieties were significantly increased (p<0.05) at the ripe stage (Table 1). At the unripe stage, the sugar content of Sisam variety was 15.98 gGluE/100 gDW, and then increased to achieve the highest value at the ripe stage (36.02 gGluE/100gDW). No significant differences (p<0.05) were found between varieties in sugars, except for Fleshy variety at the ripe stage. Vekiari et al. (2012) have found that the sugar content of two varieties of Greek carob pods (Wild and Fleshy) increased during their growth. An increase in sugar and sweetness is a part of ripening process of many fruits, and it could be due to the degradation of polysaccharides of cell wall by hydrolysis enzymes which leads to softening fruit (Prasanna et al., 2007). The ratio between the total soluble solids and titratable acidity, also called maturity index, was determined (Table 1). At the unripe stage, Wild variety showed the highest maturity index with the value of 3.42. This ratio increased significantly (p<0.05) at the ripe stage achieving the value of 21.49 (Table 1). Titratable acidity, total soluble solids, and maturity index values of Sisam variety were significantly higher (p<0.05) than those found in Wild and Fleshy varieties at the unripe stage; however, no significant differences (p<0.05) were found between the investigated varieties at the ripe stage. The Pearson correlations were analyzed between total soluble solids and titratable acidity. These parameters were very negatively correlated (r= - 0.95, p<0.001), while maturity index and total soluble solids were extremely correlated (r = 0.97, p<0.001). The decrease in titratable acidity coincided with the increase of total sugars with; hence, these parameters were very negatively correlated (r = - 0.98, p<0.001). However, the total soluble solids and total sugar contents were extremely correlated (r = 0.96, p<0.001). Total protein content of the three studied carob varieties decreased significantly (p<0.05) at the ripe stage (Table 1). The highest and the lowest values of total proteins were found in Sisam variety at the unripe (7.01 g/100 g) and the ripe stage (2.90 g/100 g), respectively. The total protein contents of Wild and Fleshy varieties were significantly (p<0.05) lower than that obtained in Sisam variety at the unripe stage; at the ripe stage, the total protein content of Wild variety was higher than those obtained in Sisam and Fleshy varieties. Our results followed the pattern reported by Vekiari et al. (2012). This decrease may be due to the accumulation of proteolytic enzymes, which lead to the breakdown of proteins. The obtained results at the ripe stage are in agreement with those reported by Vardar et al. (1972), but lower than those found by Turhan et al. (2006). As reported in our previous study (Benchikh & Louaileche, 2014), extraction of phenolics by acetone is one of the best extraction solvent used method. The results of total phenolic content (TPC) of the three carob varieties at unripe and ripe stages are presented in Figure 1. Significant differences (p<0.05) were found between TPC of the varieties for the same stage and the ripening stages for each variety. Sisam variety had the highest amount at the unripe stage (13.31 gGAE/100 gDW) while Wild variety exhibited the lowest amount at the ripe stage (2.82 gGAE/100 gDW). Mareček et al. (2014) have also reported that TPC of Triticum aestivum L depends on the variety. Our results revealed that TPC decreased significantly (p<0.05) at the ripe stage. The loss of TPC was of 63.29%, 74.48%, and 90.56% for Fleshy, Wild, and Sisam varieties, respectively. As previously evaluated in our study (Benchikh et al., 2014), the phenolic content of carob aqueous extract decreases during ripeness. The obtained results at the ripe stage are higher than those reported by Turhan et al. (2006), and Sebai et al. (2013). The decrease of phenolics throughout the ripeness could be due to the transformation of phenolic acids into compounds that are no longer detectable by spectrophotometry. The HPLC-DAD-MS method used in this study allowed to analyze phenolics. The identification of phenolic peaks (retention time and mass spectrum) was performed and compared with those found in the literature. Gallic acid ([M-H]- at m/z 169), monogalloyl-glucoside ([M-H]- at m/z 331), digalloyl-glucoside ([M-H]- at m/z 483), tetragalloyl-glucoside ([M-H]- at m/z 635), and tetragalloylglucoside ([M-H]- at m/z 787) were the major phenolics identified in the investigated carob varieties (Figure 2; Table 2). Phenolic acids and their derivatives represent the major relative content among phenolics at both unripe and ripe stages; indeed, monogalloyl-glucoside has the highest relative content at the unripe and the ripe stages (Table 3). This compound has been proposed as the first intermediate and a key-metabolite in the biosynthetic pathway of both gallotannins and ellagitannins. In fact, monogalloyl-glucoside is the product of esterification between gallic acid and UDP-glucose, and it plays a dual role, functioning as an acyl acceptor and acyl donor, in order to give digalloyl-glucoside, tetragalloyl-glucoside, and tetragalloylglucoside. In the current study, the relative content of digalloyl-glucoside, tetragalloyl-glucoside, and tetragalloylglucoside decreased in the ripe stage. Extracts of carob pulp contained great amounts of gallic acid. The relative content of this acid was higher in the ripe stage (19.53%). This fact could be due to the degradation of gallotannins (monogalloyl-glucoside, digalloyl-glucoside, tetragalloyl-glucoside, and tetragalloylglucoside). Fruit tissues are able to synthesize phenolics, and changes in this content can be induced by biotic and abiotic stress conditions (Kataoka et al., 1996). The decrease of phenolic acid ester contents during ripening suggests that they are progressively bound to the cell walls, an important mechanism by which plants defend themselves against pathogens and strengthen the cell walls (Dixon et al., 1994) and/or hydrolyzed into gallic acid and gallic acid derivatives. The total relative content of flavonoids and their derivatives increased in the ripe stage (Table 3). To our knowledge, this is the first report of data regarding the effect of ripeness on phenolic profile of carob. According to the obtained results, total soluble solids, maturity index, and sugars increased at the ripe stage of carob, whereas acidity, protein, total phenolic contents, and antioxidant activity decreased. Sisam variety had the highest amount of total phenolics at the unripe stage while Wild variety had the lowest level at the ripe stage. A similar trend was also observed for antioxidant activity of carob extract. Gallic acid, monogalloyl-glucoside, digalloyl-glucoside, tetragalloyl-glucoside, and tetragalloylglucoside were the major phenolic compounds found in carob pulp at the unripe stage. Monogalloyl-glucoside has the highest relative content of phenolics at both unripe and ripe stages. Gallotannin contents were higher in the green carob than in the ripe one. The extracts of carob pulp at the unripe stage can serve as a dietary source of natural antioxidants for the food industry. The authors are grateful to the Algerian Ministry of Higher Education and Scientiﬁc Research for ﬁnancing a stay at Université de Lorraine, France, and to all research team of the Laboratory of Engineering of Biomolecules (LIBio) for their welcome. Table 1 Physicochemical characteristics of unripe and ripe carob varieties. Figure 1 Total phenolic content (a) and antioxidant activity (b) of carob varieties. Different capital letters represent significant differences (p<0.05) between unripe and ripe stage; different lowercase letters represent significant differences (p<0.05) between varieties. Table 2 Tentative identification of phenolic compounds in carob pulp using an HPLC-DAD-MS: UV at λ = 280 nm and ESI negative mode.